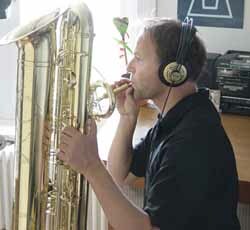 Thomas K. J. Mejer studied Saxophone with Urs Leimgruber (Jazz School Lucerne), Marcus Weiss (Konservatorium Luzerne) and Mick Green (Dartington College of Art, GB) and composition Vinko Globokar, Per Nørgard and Michael Finnissy (Sussex University). His compositions were a.o. played by Allegri Quartett, BBC Singers, Ny Dansk Saxofon Kvartett, Cambridge New Music Players, Vision Saxophon-Quartett, basel sinfonietta. As a saxophonist, Mejer concentrated himself on the Contrabass-Saxophone and on ‚Bass’-Ensembles like KONTRA-Trio, Chicago Basses, TwoTubax, Nashi Dela etc. As an Improviser he played with Martin Schütz, Fredy Studer, Michael Zerang, Fred Lonberg-Holm, Keefe Jackson and many more. Mejer received several prizes, a.o. Werkbeitrag 1993 and 1998 from town and city of Lucerne. 2004 studio space in Chicago from the Sister Cities Trust. His compositions are published at Schweizerischen Musikedition. CD’s are available on earup, Leo Records, Mode Records and Tzadik.